Remember how I said I was teaching the daughters of a friend how to quilt? I finally got their tops put together! They look pretty good, I think. Our next step is to pick out fabric for the back but since I'd like them to choose, I'll have to wait until the next time we can get together. That's okay though because I have lots of projects in the queue! It's a five hour drive to the baby shower this weekend and MIL might still be working on the binding during the car ride. I won't be attending the shower so I don't know if I'll have a final picture to post. Labels: is it obvious that i'm loving the zig zag quilts right now? Why haven't I been doing much quilting lately, you ask? Well, I'm sorta trying my hand at crocheting. Some women I work with crochet on Thursday's and asked if I'd be interested. It sounded like a good idea. I need something to do while I'm waiting to pick up the kids from practice/games/school/etc. So here's the start of my first project. I'm pretty terrible. And I refused the crochet ladies' suggestion of using thicker, solid yarn. I tried plan gray and it was so BORING. So I bought this skein thinking I'd make a scarf. If you crochet you're laughing at me right now because you know that one small skein isn't enough for a scarf. 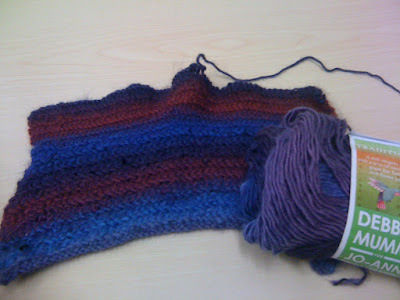 And the fact that I chose a hairy wool instead of thicker cotton. Yet I'm still plugging away. Because the love the colors. They're so pret-ty! Whether I can make something useful is questionable. Time will tell. Things are progressing nicely with the Redwing Red baby quilt. My mother-in-law has put the top together, added borders, and passed it on to me to layer and quilt it. I'll be starting that project this week and will post photos soon. In the meantime, I've been planning my next baby quilt. This one is for my good friend and extremely talented friend, Julie. She just found out her little bambino is a boy and she's decided to do the nursery in blues and browns. She's thinking elephants for a theme and I found this fabulous fabric online. It's our inspiration - both for the quilt I'm creating and the decor she's choosing for the nursery. The Purdue quilt is finally finished. Just in time to take it's place with all the other silent auction items at the fundraising event. I did a pieced backing with zig zag quilting. In the spirit of the quilt, I decided to take it's picture on campus. Since I'll never see it again, I made sure to get proper pictures. I'm getting better about documenting my work. I had enjoyed making this quilt, especially because of AmandaJean's easy tutorial. I'm ready to start my next one! I don't know what I'm going to do with these beauties but I'm anxious to cut into them. Alas, it will be awhile. 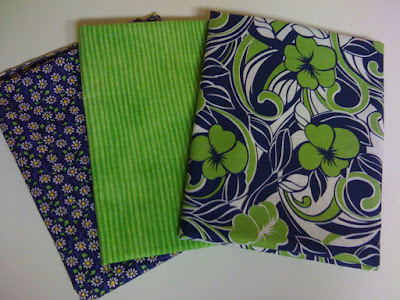 I have corn hole bags to make (by tomorrow! ), I need to finish the Purdue zig zag quilt (by Thursday at the absolute latest! 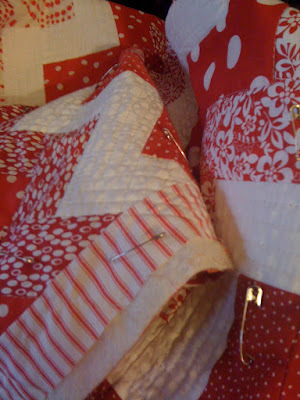 ), and my MIL and I have started a "Redwing red" baby quilt (must be completed by November 20). Maybe I should join Jacquie's Joy in the New Year Challenge.